We're sure you've already heard plenty about this 2017 Chevrolet Bolt EV from us and others, but this is the first chance we've had to spend an extended amount of time with one. As you probably also know, the Bolt EV is the first to achieve the "EV holy grail" of traveling over 200-miles on a single charge and cost under 30-grand, with federal incentives of course. The Bolt EV uses a 60kWh battery pack from LG that weighs 946-lbs. It powers a 150kW high capacity electric motor with a robust 266 lb-ft. of torque. Range is rated at 238-miles; that's further than any EV not made by Tesla. The Bolt EV earns a 119-Combined MPGe rating, and a near perfect Energy Impact Score, burning just 0.2-barrels of oil annually with no CO2 emissions. Both the batteries and the motor are liquid-cooled, and can bolt this EV to 60 in just 6.5-seconds. That's about as fast as a Mercedes-Benz C300 Coupe. But to make sure you don't get too crazy, top speed is limited to 92 miles-per-hour. And, if you've replaced your "range anxiety" with "battery anxiety", just relax. 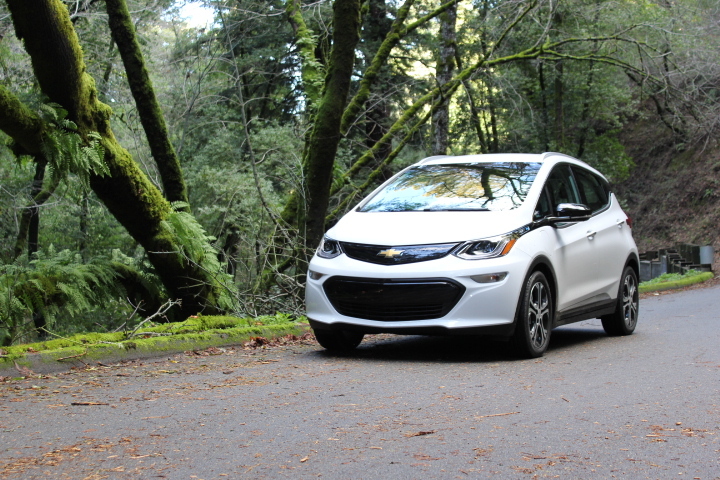 Like most EVs and hybrids, the battery pack is covered by an 8-year/100,000-mile warranty. You'll probably want a Level 2, 240 Volt charger at home to juice it up, however. With that, it takes about 9-hours to fully charge; verses the almost 60 with standard 120. Even faster Level 3 charging is an option. Setting aside the environmental benefits, as we've learned the more time we spend in the Bolt EV, it really is a great everyday car. Unlike many subcompacts, it never feels underpowered. In fact it's enormously peppy off the line, even throwing you back in your seat. It does settle down as you get up to speed, while providing more than enough capability, and is even mildly sporty in corners. You can also play with regen braking, dialing up enough to barely have to touch the brake pedal in normal driving. Overall, the interior is great, with fit and finish among the best from GM, though the piano white trim can cause some glares and reflections on sunny days. The front seating positions are also higher than a typical compact car. There's plenty of head and leg room for the rear seat too, and it really can accommodate three across. Even then, there's ample cargo space at 16.9 cu-ft. That's more than many subcompact crossovers. For more, the seatbacks fold almost completely flat. It even has that small crossover look, with no obvious EV elements whatsoever. Being fully "in the now", Chevy not only applied the "floating roof" treatment to the rear pillars, but to the front ones as well. And, wherever we went, the Bolt EV attracted quite a bit of attention. We even got a few thumbs up from petrol drivers. On that under 30G price, once you factor in $7,500 worth of federal tax credits, you're left with $29,995. State credits may lower it more. Up level Premier trim, with heated leather seats front and rear, and a host of other niceties, can be yours for $34,280. The bad news for some, is that the Bolt EV isn't available everywhere yet. That will take till the end of summer, and even then not all Chevy dealers will have made the upgrades required to sell and service it. Also, looking at it from a pure penny pinching standpoint, many 40 MPG subcompact cars are available for much less money. So, while it's impossible to predict success of the 2017 Chevrolet Bolt EV, as fuel prices more than anything else will ultimately make or break its fortunes, it's easy to recognize when the game has been changed. It may not offer the performance or cache of a Tesla, but the Bolt EV has clearly set a new standard for mass market electric vehicles; a real car that can be used by just about everybody, every day. In other words, the future has arrived, and it's built in Detroit.